A 65-year-old man presents for an annual skin check. He complains of many white spots on his arms. The patient has a history of several basal cell skin cancers. He worked outdoors on an oil rig for 40 years. 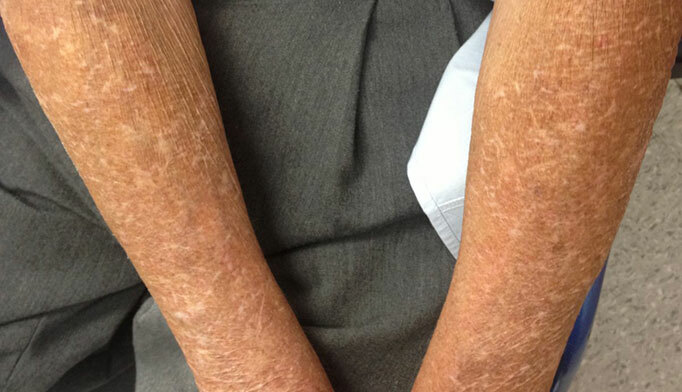 Stellate pseudoscars are a common sign of photoaging, or the cutaneous changes that result from chronic exposure to sunlight. They occur most commonly on the dorsal forearms and hands of chronically sun-damaged skin and are characterized by irregularly shaped whitish scar-like patches. Stellate pseudoscars are almost always associated with solar purpura, the easy bruising caused by solar damage to the connective tissues of the skin. This is commonly seen as purplish bruising on the forearms and dorsal hands that subsequently fades to a brownish discoloration. The condition is also similarly due to increased skin fragility and changes within the connective tissue of the dermis that arises due to sun damage. As stellate pseudoscars signify photoaging, patients who experience the skin condition are also at risk for developing skin cancers, particularly basal cell and squamous cell carcinomas. Favre-Racouchot syndrome is also called ‘nodular elastoidosis with cysts and comedones.’ Thickened yellow plaques, studded with open and closed comedones and small epidermal inclusion cysts are characteristics of Favre-Racouchot. The condition occurs on chronically sun-exposed skin, as evidenced by deep wrinkles and furrows, with the most common location being the eyes and temples. Distribution is usually fairly symmetrical. It may also occasionally occur on the forearms, behind the ears, and on the lateral neck. Most patients are white men with a significant smoking history. Cutis rhomboidalis nuchae, also called sailor’s neck, farmer’s neck and leather neck, refers to thickened and leathery skin on the posterior neck with exaggerated skin markings that form fissures or furrows in a crisscross pattern. There is often a yellowish hue to the skin. The typical patient has a fair complexion and has had significant exposure to sunlight over his lifetime. Poikiloderma of Civatte is characterized by reddish to brownish patches with telangiectasias appearing on the lateral aspects of the neck. The lower anterior neck and “V” area of the superior chest may also be affected. Characteristically, the skin of the central neck immediately below the chin is spared. Stellate pseudoscars are easily recognized as scar-like plaques on the skin of sun-damaged dorsal forearms and hands. Treatment options for photoaging to the dorsal hands and arms include various chemical peels and laser treatment, but these modalities mainly target darker blemishes. There is no standard effective treatment for stellate pseudoscars. As with all forms of photodamage prevention is paramount, since treatment is usually less than satisfying. Bolognia J, Jorizzo JL, Rapini RP. “Chapter 86: Photodermatoses.” Dermatology. St. Louis, Mo. : Mosby/Elsevier, 2008. Print. James WD, Berger TJ, Elston DM et al. “Chapter 3: Dermatoses Resulting from Physical Factors.” Andrews’ Diseases of the Skin: Clinical Dermatology. Philadelphia: Saunders Elsevier, 2006. Print. Feinstein R et al. “Favre-Racouchot Syndrome: Nodular Elastosis with Cysts and Comedones.” Medscape Reference. Accessed 18 June 2013. Available online at: http://emedicine.medscape.com/article/1119362-overview.